Could this be the UK’s smallest coffee shop? 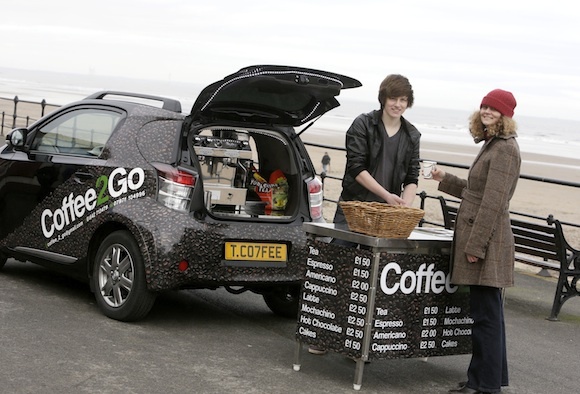 Budding entrepreneur Jason Bowes has been brewing up speciality coffees, teas and hot chocolates from the back of his Toyota iQ at events in the North East since he opened his business Coffee2Go late in 2012. 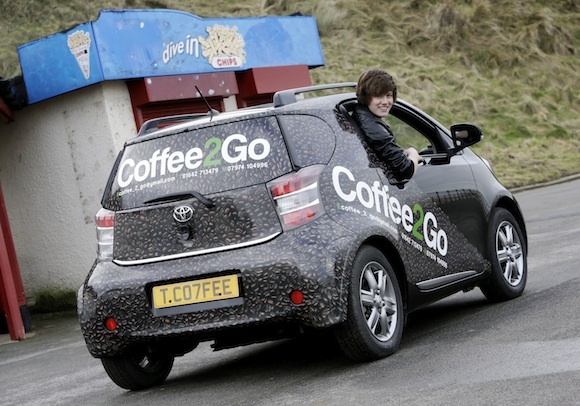 Watch our video of the Coffee2Go Toyota iQ on YouTube. 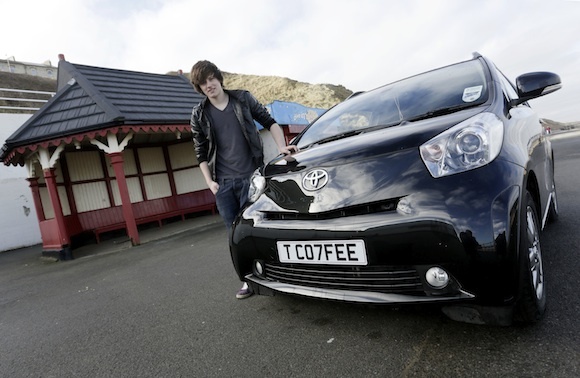 Jason, aged 20, bought the iQ2 last October, and with the help of his father Stewart immediately started work on turning it into his own mobile cafe. 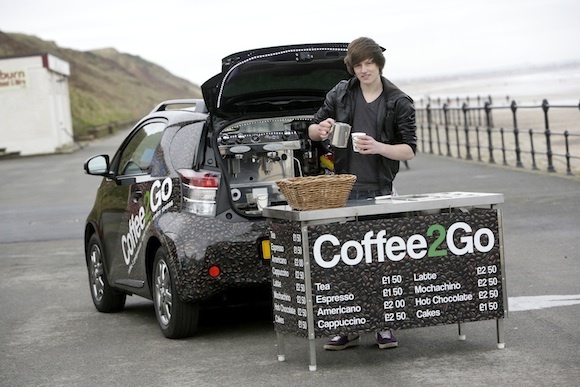 He said: ‘Dad gave me the idea of turning a small car into a coffee shop, because he owns a catering trailer business. 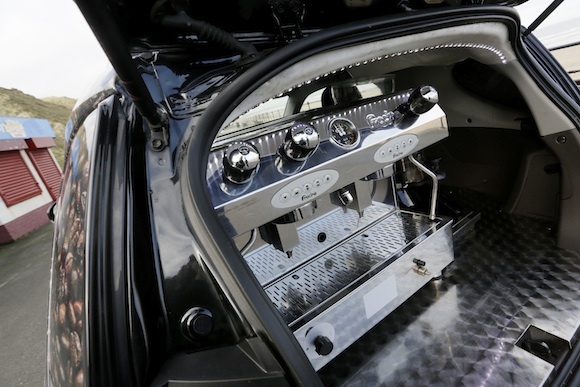 The conversion process took about a month, and involved building a frame in place of the rear seats to support the high-end Fracino Contempo coffee machine, and conceal the water and gas tanks needed to create a perfectly frothy cappuccino. ‘Squeezing everything in was the hardest part of the build. It’s a small space and we had to fit in the 75-litre water tank, a gas tank for the steam, the framework and the coffee machine, so it there was a lot of trial and error when we were doing the prep work,’ says Jason. ‘But because we built it ourselves we could take our time and shape it so it sits perfectly. We’ve not drilled or welded anything and if we wanted to, we could remove everything and put the original seats back in. There’s a great buzz around Coffee2Go – and not just from the customers ordering double espressos. That couldn’t be further from the truth. Coffee2Go is very much a family effort – while Jason manages the day-to-day business, and his dad helped with the build, his mum Janet looks after the accounts. It may be early days, but the eye-catching nature of the Coffee2Go iQ has already led to repeat bookings at Croft race circuit, Newcastle, Sedgefield and Catterick racecourses and other events around the North East. After the build, the iQ was given the finishing touches of a custom coffee bean wrap and the perfectly appropriate TC07FEE private number plate. 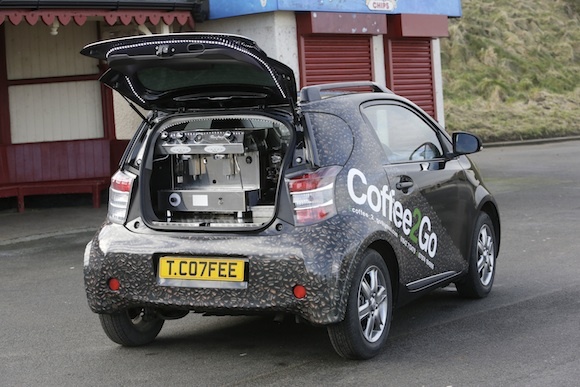 But what’s the Coffee2Go iQ like to drive? Jason says: ‘When it’s full of water and you’re going up a steep hill you can feel the extra weight a bit, but overall it’s still great to drive. You can read more of our Toyota iQ posts here, or find out why iQ is the perfect city car on the Toyota website. HI, I also like to know how the coffee machine operates? We did not have any specific details regarding the coffee machine operation unfortunately, but glad you liked the car. How the coffee machine operates? I mean, the power source is electrical or uses gas? Does it need special conection with electrical system of the car? We believe it is all electrical and no gas is involved. The reason for our hesitating is because this was a specialist conversion which Jason built himself with a lot of custom made features and ideas. Not sure about the power but we can ask Jason for you? David, thank you very much for your response. And yes, it would be great if you ask Jason about the power source. Best regards. Is it ok to put things on the roof of the iQ now, then? That’s a useful improvement over the original design where I thought no roof load was permitted. The roof bars here, on the Coffee iQ, are in fact a custom build (we just had word from the owner!). As per your comment, there are no Toyota approved roof bars available. Hi, Great car, great idea ! Was just wondering where those side bars on the roof were coming from ? I would be really interested to do the same ? The roof bars on the Coffee iQ were a custom build by the owner. We do not make approved roof bars for the iQ as an accessory item. Where does the table fit? The table is fitted onto the roof of the vehicle, this can be seen through our You Tube video here: https://www.youtube.com/watch?v=BShXi-oqv_8. We hope you liked this innovative piece! Would be a good idea to get him to do some showroom visits and show potential customers what the iq is capable of.